A user log in is necessary to meet the requirements of the HIPAA HI-TECH act. Enter your log in name and password. • Your log in name consists of 3 or 4 characters (usually your initials). You may use any combination of alpha or numeric characters. • The password requires at least 6 alpha or numeric characters. • Password are not case-sensitive. • The first time you access RxInterventions©, the program will let you add your log in information. This is referred to as an "open" log in policy, i.e., anyone can log in to the program. For example, a new user will encounter this dialog. • All fields are required. • Click the button to the right of password hint input to display your password. • The password hint is displayed if you type in the wrong password on the log in screen. • The log in to RxInterventions© may be open or closed. • The default policy is "open", i.e., a new user can add his own log in information. • Contrast this to a "closed" log in policy which requires someone with knowledge of the password to add new users. • You select open vs closed log in on the user database window. 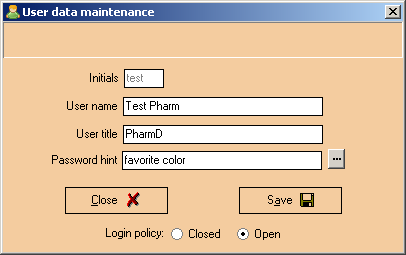 You may quickly log out of RxInterventions© with the key combination Ctrl+O, this takes you back to the log in screen without exiting the program.